The collective popular vision of the “perfect” Italian restaurant was created in 1955 in the delightful, Disney animated movie, “The Lady and the Tramp.” Arguably the most memorable scene featured two star-crossed pooches sharing a plate of spaghetti while an adorable owner and his able waiter serenaded the canine kissers singing “La Bella Note” (A beautiful night). Fortunately, in real life I’ve never witnessed any diner push a meatball across their companion’s plate with their nose, as Tramp did in the movie, but luckily I have discovered my own “perfect” Italian restaurant where the air is laced with equal parts of romance and garlic, and the owner Joe Salas and his employees provide charm and welcome, just short of singing. 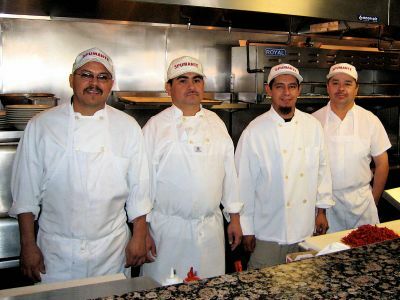 Spumante has been serving up first class Italian meals in Studio City/North Hollywood for nineteen years, and the same staff has been there the entire time; in fact the loyalty between owner and personnel is legendary. 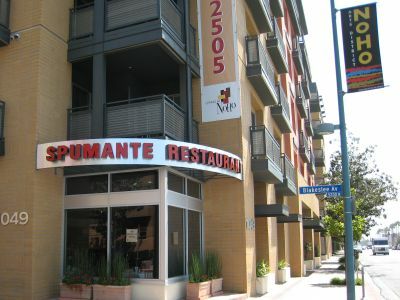 As the story goes, after fifteen years on Ventura Boulevard, Spumante had its lease yanked away in December 05. Customers were shocked and crushed. Joe immediately obtained new quarters, but in a building that was just beginning construction. So, Joe found jobs for all his help in other restaurants, and everyone waited…for over three years. When Spumante reopened in August 2008, every busboy, waiter, and cook returned, along with a crowd of pasta starved friends and patrons, yours truly included. The grateful who jammed the new Spumante that night would agree that the restaurant’s success is three-fold. First, Joe is at the center of their popularity. A warm, dashing, host, he’s a man who apprenticed for seven years at the famed El Rincon restaurant in Madrid as both chef and waiter, and was also a head waiter for the Norwegian /American ship lines for seven years more. He is charisma personified. 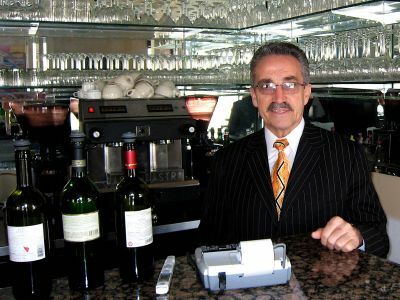 For example, when I asked him recently, “What celebrities come in here?” Joe replied, “All my customers are celebrities.” Indeed, he treats every diner as a VIP, although no less than the legendary Marlon Brando, was a regular patron and a great fan of Spumante’s steaks. The next big draw is, of course, the food itself. Daily, along with light savory pizzas and Italian pasta favorites such as Fettuccine Alfredo, Spaghetti Bolognese, and lobster ravioli, are six to eight fresh fish dishes, and a variety of meat courses including a tasty Osso Bucco, New York Steak, and a rich Veal Picatta sautéed with lemons and capers. Perhaps their most popular dish (and my personal favorite) is the giant Hawaiian Shrimp, grilled with capellini marinara. And take note, at Spumante they daily make their own fresh pasta, pizza dough and bread from scratch. Of course they have a stellar wine cellar (pardon the rhyme) and have recently added an array of mixed drinks including a delicious sour apple martini. Emmy nominated writer Fred Rubin wrote and produced network television comedy for twenty-three years. He has also written articles for The Los Angeles Times, Emmy Magazine, and the Studio City Sun. He is also a writing teacher at UCLA in the department of Theatre Film and Television.